For many of us who are fortunate enough to afford higher education, going to college is akin to flipping the page and embarking upon a new chapter in our lives. Monsters University reminds me of the time when I first arrived at the new college campus (at a foreign country) and the excitement that rushed through my veins to all parts of my body as I knew that it was the start of an adventure. Watching Monsters University puts me back into that thrill mode. Directed by Dan Scanlon, Monsters University is a prequel to the 12-year-old Monsters, Inc. (2001) starring the inseparable Mike Wazowski (voiced by Billy Crystal) and James “Sulley” Sullivan (John Goodman) as freshmen at the scarring school. The movie brings us back to the childhood time of Mike and sets the stage for when Mike was aspired to become a “scarer” during a field trip at Monsters, Inc. If you weren’t too young when you watched Monsters, Inc., you should remember that scarers are responsible to enter the human world to scare kids in their sleep so they can collect scream energy to power the Monsters’ metropolis. In order for Mike to qualify as a scarer, he needs to attend a scarring school. Fast forwarding to his first semester at Monsters University, Mike met the then-talented-but-indolent Sulley who bears an august family name. After several incidents Mike and Sulley became rivals and got themselves into trouble with the icy, authoritative Dean Hardscrabble (Helen Mirren) during the final examination day. In order to continue with the scare program, Mike and Sulley made a bet with the dean and were compelled to participate in the annual Scare Games, where fraternities and sororities at Monsters University compete for the glorifying championship. The rivals then joined Oozma Kappa, a group of misfits at Monsters University, to compete with Roar Omega Roar, the elite fraternity, among other Greek groups in the Scare Games. The group been through ups and downs during the competition, became a laughingstock of the entire campus, and finally advanced to the final challenge with Roar Omega Roar. After a tight contest, Oozma Kappa emerged as winner of the Scare Games for the very first time. Mike, however, was devastated when he learned that Sulley manipulated the equipment to help him win the final challenge. To prove his capability of becoming a scarer, Mike sneaked into the school lab and entered the door to the human world. Sulley, who was guilty of his act, followed Mike’s footsteps in order to rescue him. Trapped in the human world, Mike figured out that the only way to get back into the monsters world was to generate enough scream energy to bring them back to the school lab. They finally succeeded but were expelled from the university for their actions. 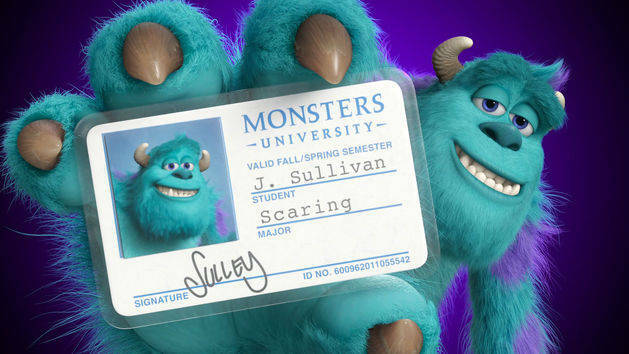 Sulley and Mike later joined Monsters, Inc. in the company mailroom and worked their way up to cafeteria boys, then to can wranglers, and eventually become a part of the Scare Team, making possible for the events in Monsters, Inc. the movie. Compared to recent Pixar movies, namely Brave (2012) and Cars 2 (2011), Monsters University lacks a focused lesson to take away from watching the movie. The prequel covers moral stories related to friendship, ambition, determination, honesty, and self-confidence. However, the central lesson seems vague as there were multiple climaxes in the plot. For those who haven’t watch Monsters, Inc., the friendship between Mike and Sulley may not appear solid enough in Monsters University, as it doesn’t touch quite the depth of Woody and Buzz from Toy Story. 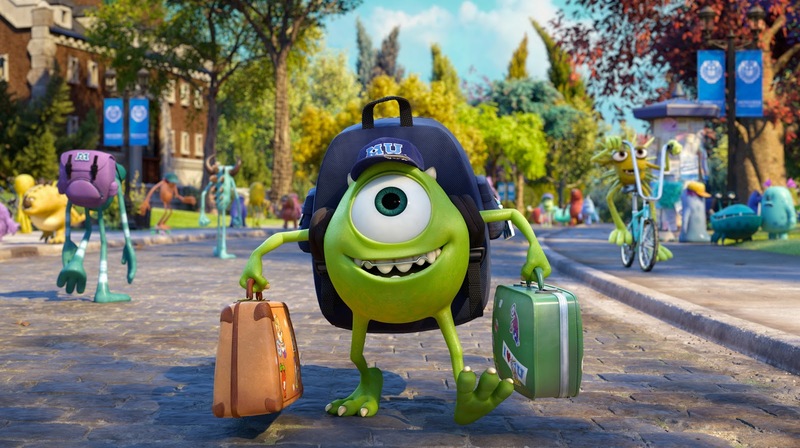 Nonetheless, Monsters University portrays the campus life to its finest. The images of campus architectures, pop culture references, and the tradition of touching a campus statue (John Harvard?) for good luck all glorify the public expectations of an American college lifestyle. Prior to screening, Monsters University revealed a fully functional “school website” (www.monstersuniversity.com) as a teaser for the film. As a marketing geek, I was awe-struck by this ingenious gimmick that parodied the college experience in such a brilliant way. All in all, Monsters University is still a funny entertainment of the family. The storyline is not quite surprising but remains its charm that would capture the hearts of the youngsters. The only misfortune was its simultaneous release with Despicable Me 2, a Universal Pictures animation that opened to No.1 in the North American in its first weekend, according to Box Office Mojo. This review was originally written for University Chronicle. Good review Jason. It’s cute and sweet with it’s message, but nowhere near being anything original or charming like the original was. Not even close.